Shorts Spotlight: Brasil: a selection of shorts from Brasil. The Boston Latinx Pride celebration will conclude with a Dragapalooza Paint Party & Latinx Drag Show hosted by the Imperial Court of Massachusetts on April 15, an event to benefit Latinx Pride programming. For more information and a detailed calendar of events, click here! 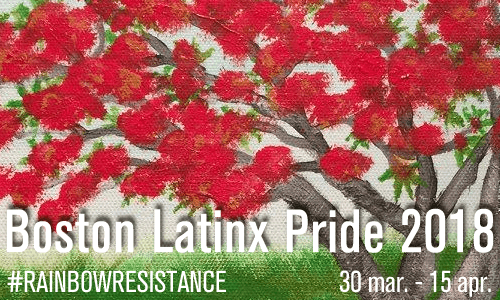 In addition to these local events, Boston Latinx Pride seeks to encourage ongoing solidarity with our fellow community members in Puerto Rico. While it has been months since Hurricane Maria devastated the island, federal agency support is dwindling and many areas are still awaiting the restoration of electricity and access to clean water. In light of the continued dire situation, Boston Pride is extending its fundraising campaign to assist the queer community in Puerto Rico. Donations are still accepted to benefit Waves Ahead, a Puerto Rico-based LGBT organization that is providing on-the-ground relief. For more information and to contribute to the recovery efforts, please click here.